Premium Medical Mini Dog Tag with blue medical Emblem. Mini Medical ID Dog Tag. Free engraving and shipping. 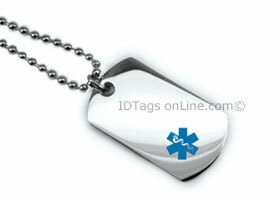 Premium Medical Mini Dog Tag with embossed medical Emblem, IDNS29 is 1 1/2"x 7/8" or 38 mm x 22 mm. It is made from .050" thick premium Non-Allergic Stainless Steel. Dog Tag is guaranteed to be rust free for life. Blue enameled medical logo is embossed on the front of the plate. Mini dog tags with red and clear medical emblems are also available.